:: We’re a band from Southend, signed to RCA Records. These guys are awesome live I’ve seen them 7 times now. This time was even more awesome. Great set list and guitar playing and vocals were incredible. Only thing I didn’t like as much was there was very poor crowd control. Within the first two songs, me and my friends were split up and we didn’t see each over till the end of the concert. The crowd was literally jumping on each over. Some of my friends did not even have their bags checked at the door which is dangerous. 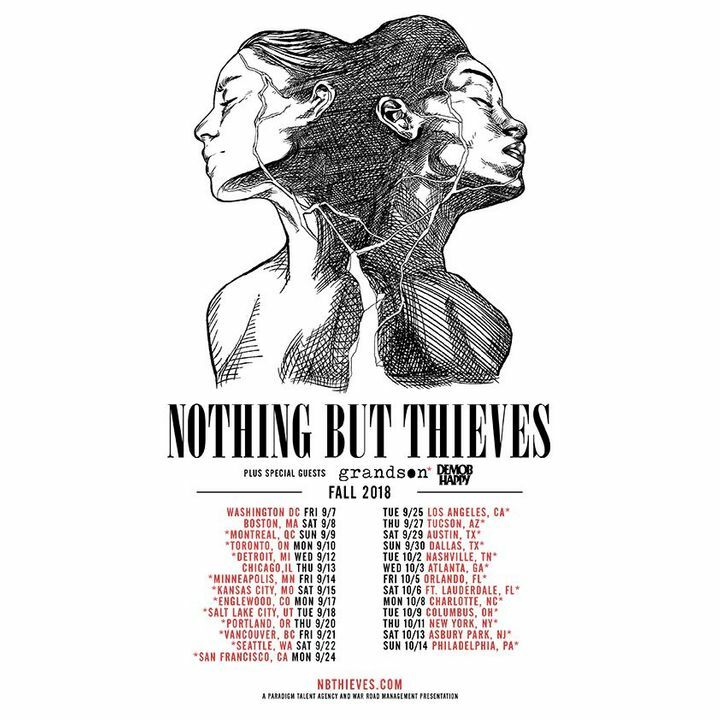 I’ve seen better NBT shows. I might be over critical or generationally bias but the shows are too polished or choreographed and lacking the stage presence rockstars should have. Connor, the lead singer is soft and doughy. Worst haircut ever. His whole appearance and stage presence needs an immediate upgrade. However, on a lighter. Note, his voice is very powerful and the songs are produced very well. Without that they’d be a D band instead of a B band. I allllways have the most amazing time at their shows!! Such amazing music! And they always choose opening acts that are so talented and friendly:) Grandson is freaking amazing and Demob Happy are the sweetest guys ever. Can't wait for their next album and tour! Bands performed well but whoever was in charge of the mixing board was just terrible. Was center of show and the bass was turned up so loud that it was drowning out other instruments and even the lead singers for both Nothing But Thieves and Grandson.